VB3 now supports the use of the sustain pedal for... sustaining notes! 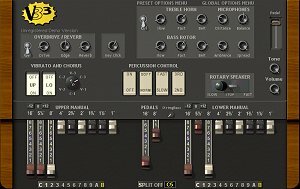 VB3 1.3 introduces the new "Advanced MIDI Learn" function that enormously extends the number of compatible hardware controllers. Please feel free to download and install the update by overwriting the old executables. VB3 1.3 is backwards compatible with previous versions, so nothing will change within your saved projects. Also, it's important to notice that practically nothing changes sound-wise, the DSP part is identical to version 1.2.2. This new release just covers some of the urgent changes that many people kept asking in the last 18 months.